Geta (Publius, or Lucius, Septimius Geta Augustus;[note 1] 7 March 189 -26 December 211), was a Roman emperor who ruled with his father Septimius Severus and his older brother Caracalla from 209, when he was named Augustus like his brother who had held the title since 198. Severus died in 211, and although he intended for his sons to rule together, they proved incapable of sharing power culminating with the murder of Geta in December of that year. On his coins Caracalla, who became Augustus in 197, was shown with a wreath of laurels, while Geta remained bareheaded until he himself became Augustus in 209. Between 209 and their father's death in February 211, both brothers were shown as equally mature young men with a short full beard, ready to take over the empire. 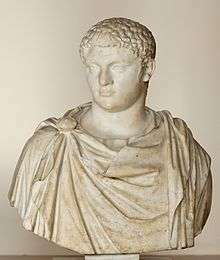 Between the death of Septimus Severus and the assassination of Geta, Caracalla's portraits did not change, while Geta was depicted with a long beard with hanging hairs much like his father, a strong indication of Geta's efforts to be seen as the "true" successor of his father. 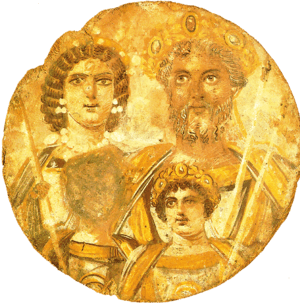 The Severan Tondo, a painting of Septimius Severus with Julia Domna, Caracalla, and Geta, whose face is smeared out, probably because of the damnatio memoriae put against him by Caracalla. ↑ In Classical Latin, Geta's name would be inscribed as PVBLIVS SEPTIMIVS GETA AVGVSTVS.